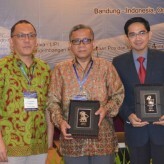 IC3INA (International Conference on Computer, Control, Informatics and its Applications) is an annual conference, organised byResearch Center for Informatics, Indonesian Institute of Sciences (LIPI). 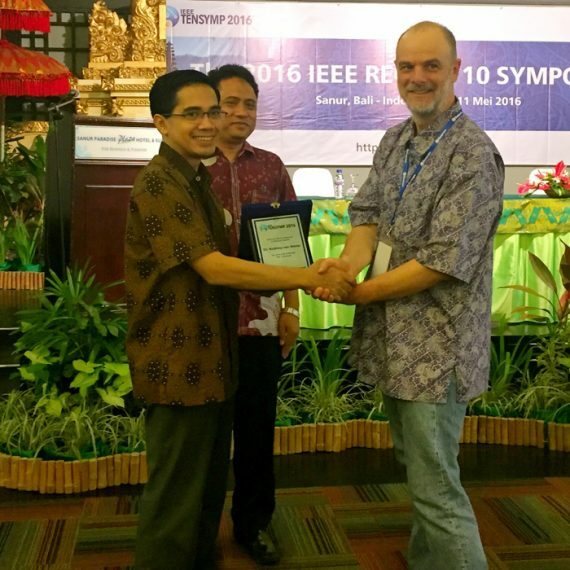 Since 2013, the IEEE Indonesia Section co-organised this conference as technical sponsor. 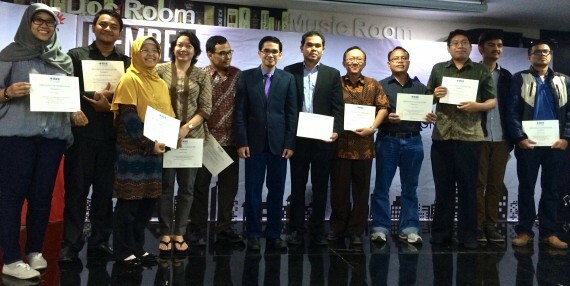 This year, IC3INA was conducted in Bandung, October 21st-23rd. 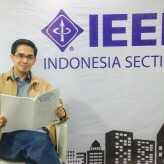 I attended this conference as one of Scientific Committee member, and as the chair of the IEEE Indonesia Section. 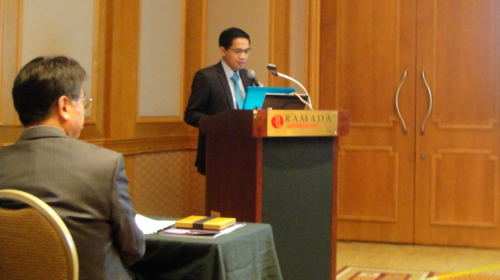 Last year (2013), they made me the moderator of all keynote speech session on opening day. 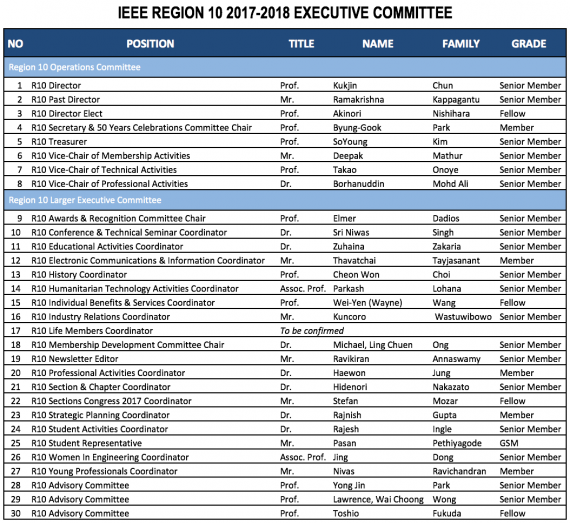 But this year (2014), they only wanted me to present a 5 minutes speech as an IEEE representative. It’s always enchanting to be around the community of scientist, researchers, academicians, and technology professionals. 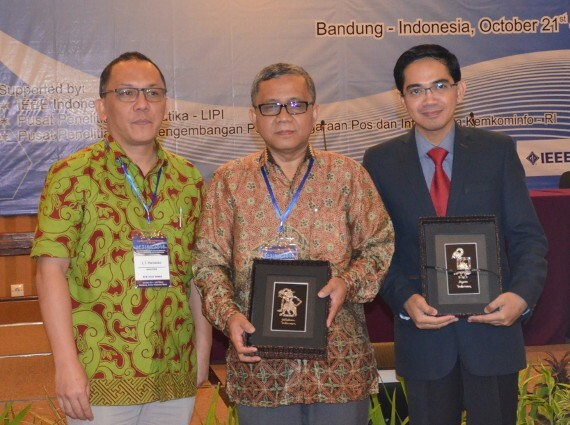 Representing the IEEE, and especially the IEEE Indonesia Section, I would like to express our gratitude to be involved for this distinguished event, the IC3INA 2014 in Bandung, Indonesia, organised by LIPI. We have known that the IEEE was established more than 125 years ago. This organisation is a home for scientists and engineers from the industrial world and academic domain to synergise their idea, and to collaborate their efforts to understand more about the nature and to engineer it toward a better life. 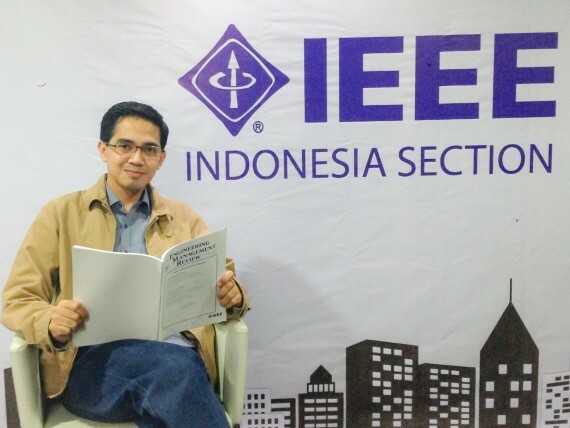 In Indonesia, the Section was established only 26 years ago, and is now actively fostering the academic and professional engineering activities in Indonesia with its 10 chapters representing 15 different fields, and 7 student branches. It is a place for the engineering ecosystem to work in partnership and collaboration to enhance the dynamics and quality of our researches, our academic and professional works, for our mission to advance the technology for humanity. The second decade of the 21st century has been witnessing new paradigms for the Information Technology. The Internet, which has previously revolutionized the communication and interaction among people, has started its next evolution to be the Internet-of-Things (IOT), with the ability to connect any digital entity or virtually anything to the network of information and knowledge. Information processing does not stop with just doing computation over data input, but would also enrich the information with aggregation of various supporting knowledge, with context-awareness. Big data technology allows the aggregation of large amounts of information from various sources intelligently to obtain results that are sometimes unpredictable. But the challenge is to develop and to implement those new computing paradigms in real applications to enhance the value of human life. While we carry out researches on Big Data, we keep in mind that this is one of the key technologies to improve the quality of life. We expect better understanding to the universe and human, better education approach, personalised health care, smart city integrated with ubiquitous sensing networks, smart businesses that understand their customers in person, better approach for environment conservation, and others. The interesting thing about Big Data is the necessity on its implementation to maximize the role of the ecosystem, to involve all stakeholders in designing a disruptive lifestyle with this technology. So let’s have some discussions, and warm networkings. All the best for you; all the best for the profession. Thank you. 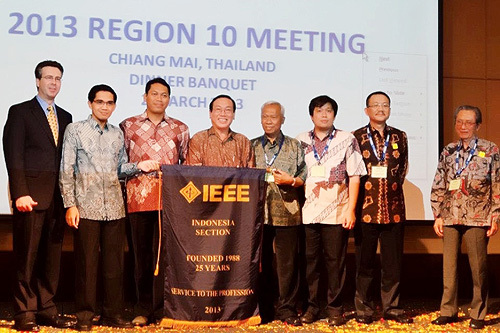 IEEE Region 10 Meeting this year was held in Chiang Mai. This is an annual event, and formerly held in the city of Lapu Lapu, Yogyakarta, and Kolkatta. 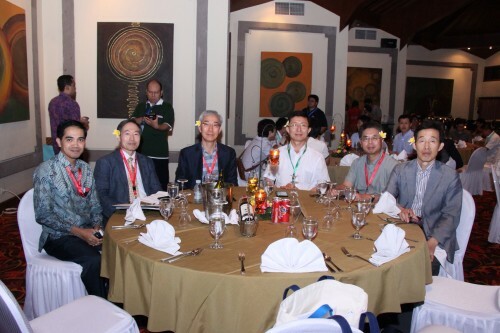 Besides all the Section Chairs in Asia Pacific, and the Officers of IEEE Region 10, also attended some VP of IEEE HQ. 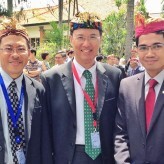 I recognised some familiar faces was, especially from the previous meetings in Lapu Lapu and Yogya. But none of the IEEE Presidents was present. But it’s OK. I’ve already meet Prof Peter Staecker, the Prisident, the previous weekend in Tanjung Benoa. 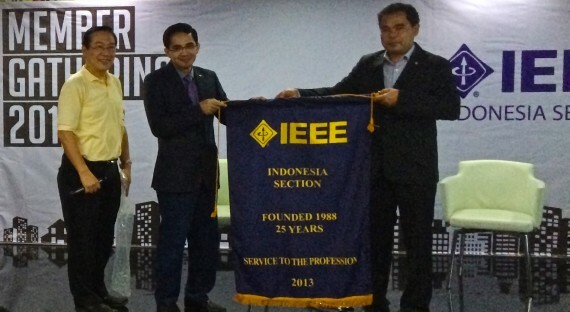 This year, the IEEE Indonesia Section received a special invitation to obtain the 25 Years Banner. 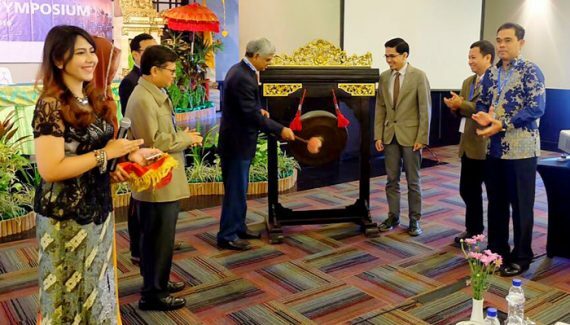 When the invitation was received, M Ary Murti, who was serving as the Section Chair decided to invite all the previous section chairs to present in Chiang Mai. And all the former chairs agreed to attend. Later, the leadership was handed over from Ary to me (via election, certainly). 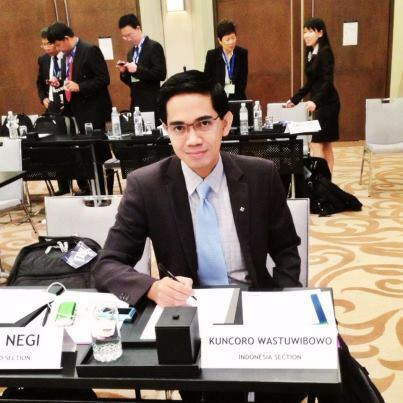 So this time, I was the primary delegation of Indonesia, and the former chairs be the secondary delegations. The flights we used were Garuda Indonesia for Jakarta – Bangkok, and Thai Airways to Bangkok – Chiang Mai, on March 1. 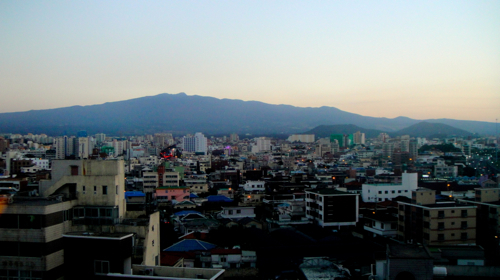 We landed in Chiang Mai at night, and went straightly to Le Méridien. The meeting would began on Saturday morning, March 2, 2013. IEEE formal meetings use the protocol called “Robert’s Roles of Order” that is used in some parliaments. This is an interesting protocol, which facilitates shared decision-making more effectively. On the first day, Region 10 evaluated the Budget 2012, proposed the Strategic Planning, and displayed the work plans of the units, as well as support from HQ and Region 10 to Sections. We also learnt best practices from the various Section and other task units. The activities of Women in Engineering (WiE), students, and GOLD (Graduated on Last Decade) were highlighted. Some incentives were also offered to enable the specific activities in the Section. Later that evening, a gala dinner was held. At this dinner, presented a variety of awards, to the most active section, most active small section, best volunteer, and others. 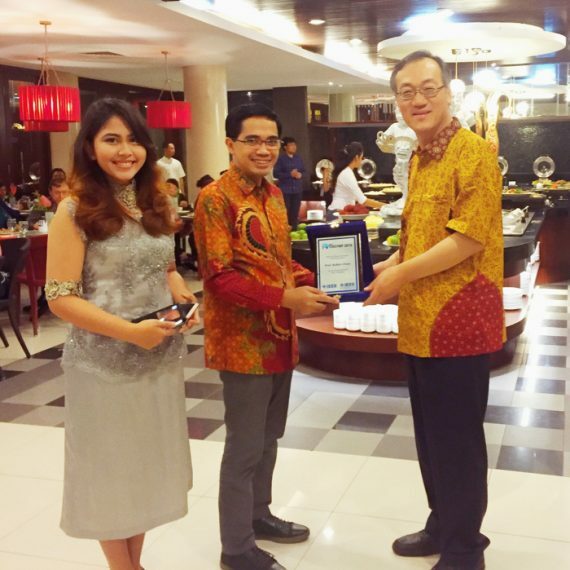 The banner of “25 Years Anniversary” was also handed over to Indonesia Section at this event. Ralph M Ford (VP MGA) handed the banner to me as Indonesia Section Chair, and we handed it to all of the previous chairs of the Indonesia Section. I asked Dr Wahidin Wahab to give a brief remark. Mr. Wahab presented a bit about the history of Indonesia Section and some gratitudes to those who helped the development of Indonesia Section. The second day was started with a petition to award Prof Marzuki, a leader in Region 10 who passed away last year due to a long illness. 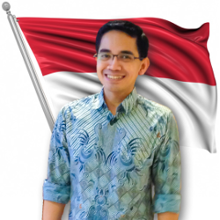 In the midst of the pain, he did not stop doing organisational dan professional tasks, including supporting many activities for the Indonesia Section. Indonesia Section specifically stated a grief at the previous night. Then reviewed the Budget Plan for 2013, the report of Tencon 2012, and plan of Tencon 2013, and R10 Congress 2013 (Hyderabad). 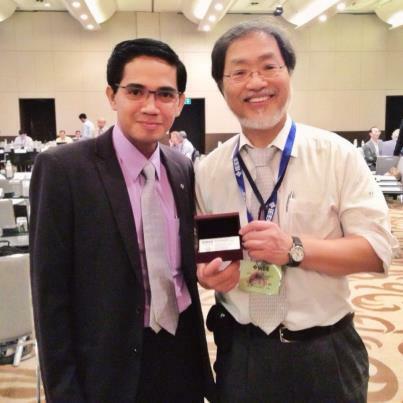 I talked briefly to the Region 10 Director, the always joyous Prof. Toshio Fukuda; invited him to be the Keynote Speaker of the IEEE Cyberneticscom in Yogyakarta later this year. He confirmed. Then presented the information and policy on the administration of Section and units under it. There were some new things, and some important repetitions. The meetings were closed after midday. After that, a brief tour around Chiang Mai. 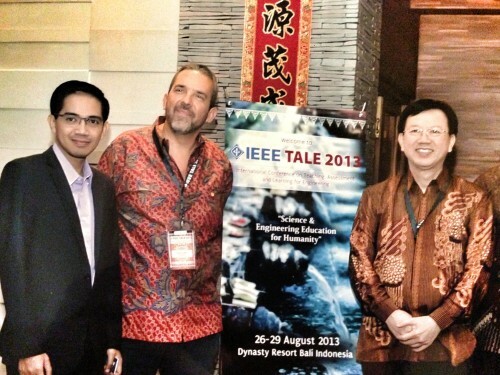 The twin conference IEEE Comnetsat and IEEE Cyberneticscom in Bali last July, apparently leaving continuing effects. While the organisers evaluated that everything is far from perfect, the two keynote speakers might have different impression. Dr Ford said that Prof. Lightner (President of the IEEE, 2006) at a meeting in Hong Kong praised the twin conference as fully IEEE compliant, including small things like the visual designs; then suggested Indonesia to submit a proposal to host the IEEE TALE conference in 2013. 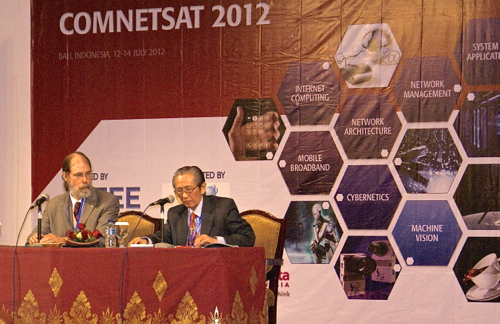 Prof. Byeong Gi Lee (President of IEEE Comsoc, 2010-2011), in a communication after the Comnetsat, also encouraged Indonesia to host APCC 2013. Prof Lee himself is the General Chair for APCC 2012. Then we were invited to submit proposals, at APCC 2012. Prof Lee are extremely intelligent and gentle, but firm. So albeit his tone soft, we interpreted his message as a command. APCC, Asia-Pacific Conference on Communications, is a very prestigious regional conference in one of the regions with the highest growth in the IT world. 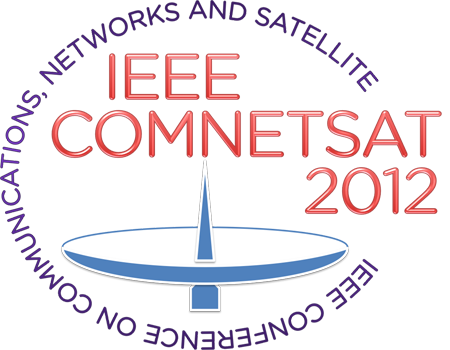 For the international level, the IEEE Comsoc has ICC and Globecom. 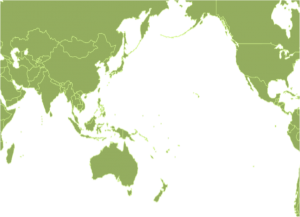 For the general technical issues, the IEEE Region 10 Asia Pacific has IEEE Tencon (hosted by Indonesia in 2010). APCC is like a slice for both. However, due to its specific field, personal and professional relationships among its Steering Committee (ASC) are very closed. 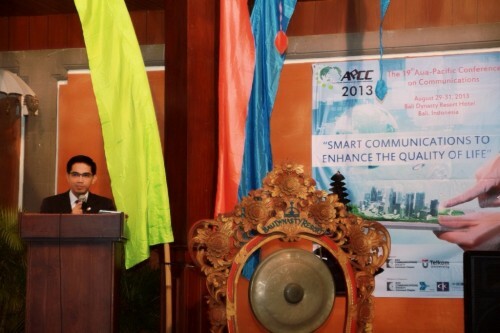 APCC, besides sponsored by IEEE Comsoc, also supported by the KICS in Korea, IEICE in Japan, and the CIC in China. APCC was first held in 1993 in Taejon, Korea. The 18th APCC is conducted this year in Korea too, but in Jeju Island. 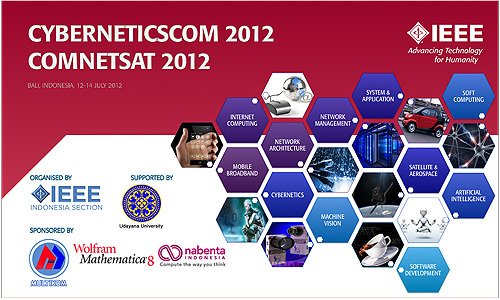 Comsoc Indonesia (Indonesia IEEE Communications Society Chapter) has started the plan. Assessments has been conducted since Ramadan this year. 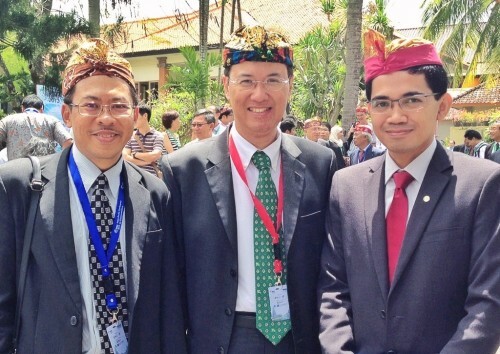 But Comsoc officers in Indonesia are small and very busy. So we just made a brief proposal; expecting that we will have the opportunity to discuss with the ASC about it. After some discussions, Indonesia will send, as delegation to APCC 2012: me (as Past Chair Comsoc Indonesia), M Ary Murti (IEEE Indonesia as Chair, but indeed also a Past-Past Chair of Comsoc Indonesia), and Agnes Irwanti (Secretary of Comsoc Indonesia). 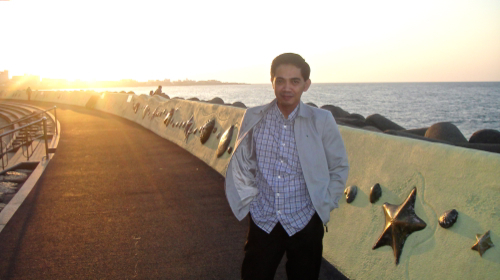 I departed from Jakarta on October 13 evening, had flight with Garuda Indonesia, and arrived at Incheon October 14. At Incheon, I joined Ary and Agnes. We had a small visit to Seoul, followed by Korean Air flight from Incheon to Jeju. Jeju is an island located in the south of the Korean Peninsula. APCC 2012 commenced on 15th morning. Opening was conducted by by Prof. Jinwoo Park, President of KICS; Prof. Byeong G Lee, from IEEE; then Prof. Yang Zhen, Vice Chair of the CIC. Plenary session was presented by Prof. Tomonori Aoyama, who is also one of the pioneers APCC, with the theme New Generation Networking (NWGN) and Inter-Cloud Computing to Handle Big Data. NWGN, also called Future Internet, is not just a development of TCP/IP suit, but a design of new network architectures that might be based on Post-IP Network. Break, we took pictures with some of the participants from Indonesia, who are students in Korea and Japan. After the break, the ASC held a separate session, to discuss the organising of the APCC. Included is a discussion of the next APCC host. So the we joined the ASC meeting. The meeting occupied a seminar room; attended by the members of the ASC, the titan in Communications Technology. Beside them, the delegations from Indonesia and Thailand also attended the meeting to bid for the next host. Thailand performed first, with excellent presentation, detail, and supplemented with some souvenirs from their country. 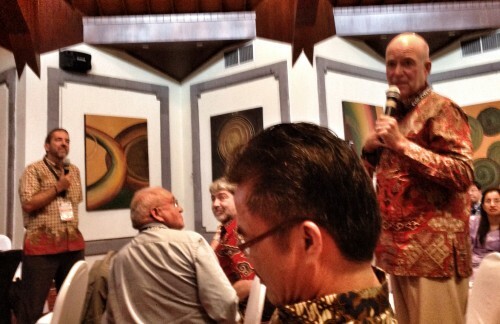 Presentation of the Indonesian delegation was presented clumsy Koen. I had only a simple presentation, but I put the focus on the selection of the theme, time, and the situations. I guess both delegations could show good plans and commitments. Soon, we were asked to leave. About fifteen minutes later, we were asked to enter the meeting room. 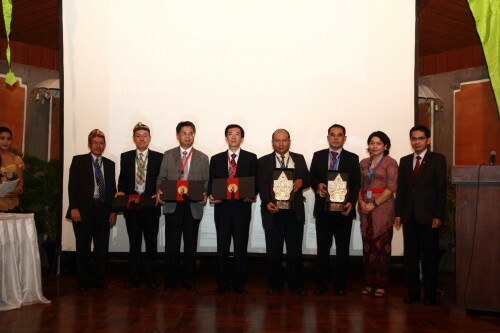 The ASC had decided to choose Indonesia as the host for APCC 2013, with Comsoc Indonesia as the organiser. We were also asked to give a short speech at the banquet the next day. On 16 morning, I still attended the Plenary Session. Prof. Zhisheng Niu discussed the theme of Rethinking Cellular Networks – A Novel Hyper-Cellular Architecture for Green and Smart ICT. Then I just realised that I was a bit tired. We took time to freshen up with a walk to the beach just about the hotel. That night, we were invited to attend the Banquet of APCC. As the next host in 2013, we were asked to sit at one of the VIP tables. Of course in such events, toasts were so routine. Kempai! But they provided a bottle of Coca Cola for people like us who does not drink alcohol. I asked Mme Agnes to represent us giving a speech about APCC 2013. 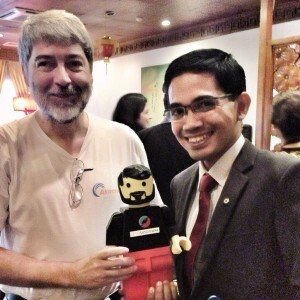 Some VIP also came to our table, discussing the next plan for APCC 2013. The next morning, I woke up very early, and ran away from the hotel. I found almost no taxi in Jeju that early. But there was a Korean asked me to join him with a cab to the airport. From Jeju Airport, Korean Air flew me to Gimpo within 1 hour. After a brisk walk about 500 meters, I got into Arex (Airport Express). Arex is a train connecting Gimpo to Incheon, in about 40 minutes. At Incheon, I simply checked in on Garuda, walked fast immigration desk, walked faster to the connecting station, and got by Gate 107 when the passengers started boarding. Seven hours later, I’ve arrived in Jakarta.